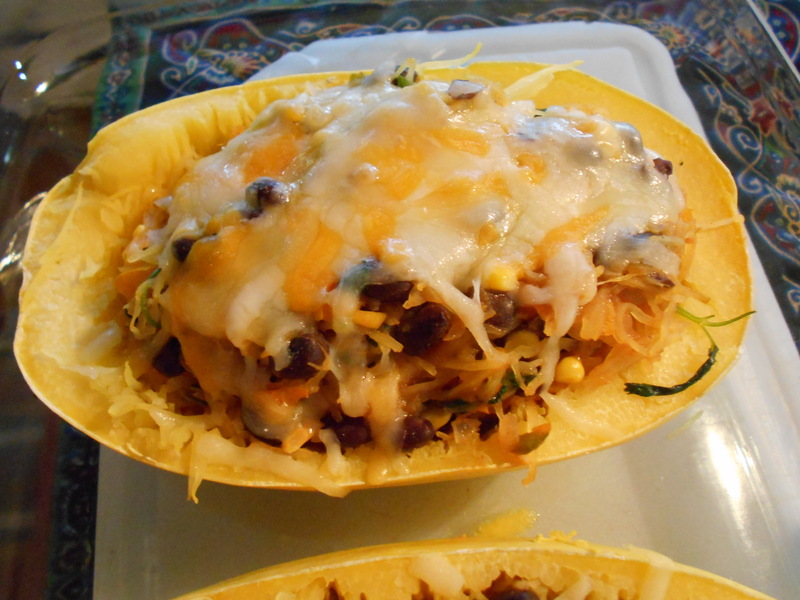 Here’s another yummy spaghetti squash dish that is easy to make and healthy to eat. It’s a vegetarian dish and I hope that you will like it as much as I have. Pre-heat oven to 375. In an oven proof dish, pour 1 C. of water in the dish and place your squash halves, flesh side down, in it. Place the dish in your pre-heated oven for about 35 minutes or until a sharp knife can pierce the skin easily. Take out of oven and let the squash cool for a little bit before you rake it with a fork to remove the strands—but careful, leave the shell in tack for the stuffing. Place the squash back in your dish(which now has no water) because you will be placing the stuffing in the squash and back into the oven for a bit. Turn the oven down to 350. I used my food processor to pulse quickly into chopped pieces the items listed in #3 through #5. In a large pot, over medium heat, place the olive oil and when heated, stir in the items #3 through #5 till softened and glistening (about 5 minutes). Then add the ingredients #6 through #12 and cook till well melded for about 2 minutes more. 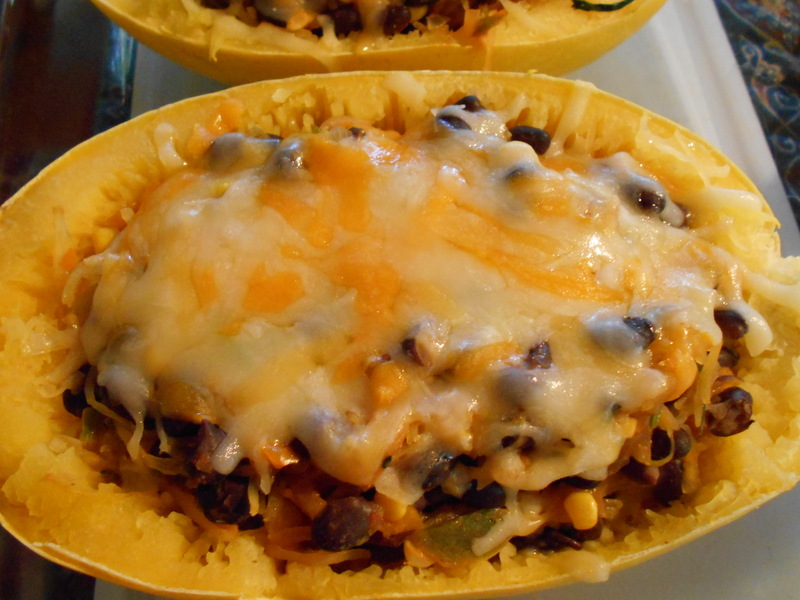 Place the stuffing you have just created in your shells and sprinkle each with the cheese. Place your dish back in the 350F oven for about 20 minutes. Voila—delicious. If you wish to garnish with the avocado slices and sour cream go ahead and do this now. And of course, some nice warm corn tortillas make for a wonderful accompaniment. 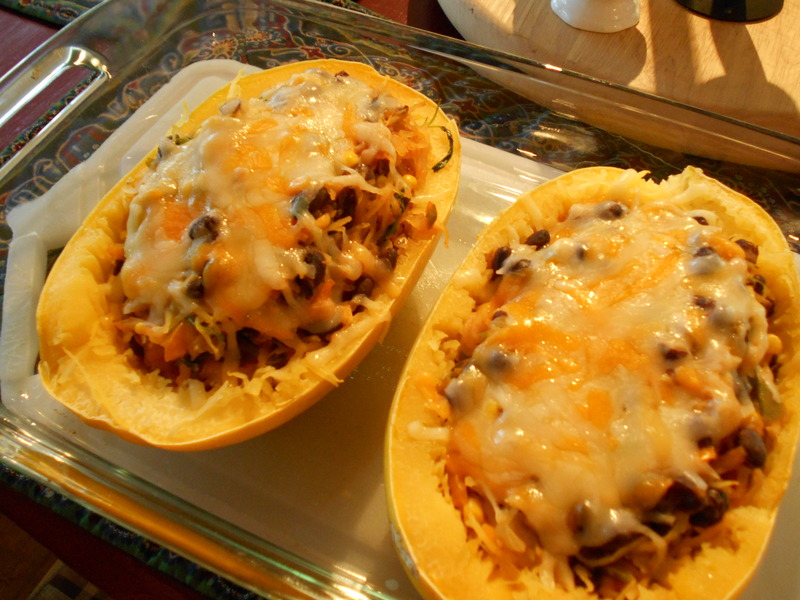 As well, I’ve noticed that these two spaghetti squash recipes I have made taste even better the next day. Here’s a very delicious and economical healthy dish that is perfect for the vegetarian, the person who wants no carbs and for the person who wants to loose some weight. It’s also a pretty one to serve. It’s a dish that does entail a bit of effort and time but the end result is well worth it and you can cut out some steps if you so desire. 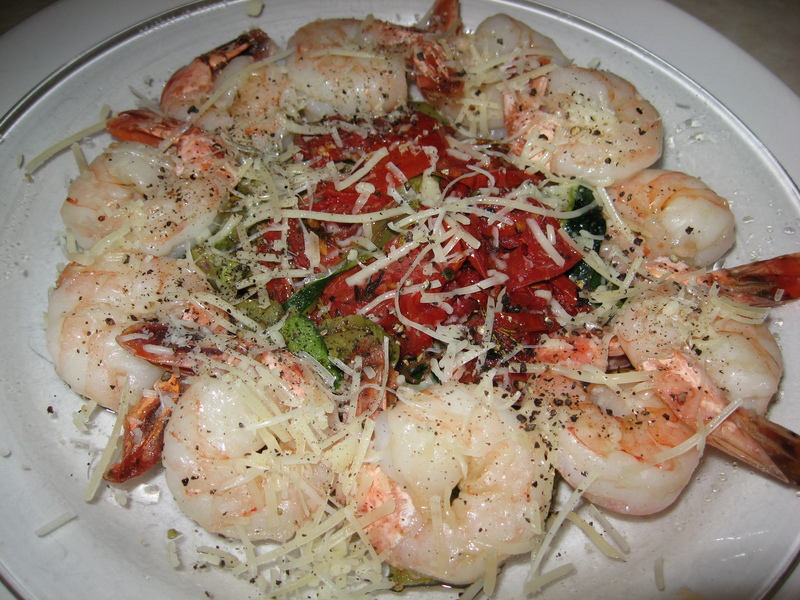 As well, if you wish to serve it for guests as a more “complete” meal, you can serve it topped with lightly sautéed shrimp–and I like them sprinkled with some crushed red pepper flakes- and a side of crusty French bread. Bon Appetite!! 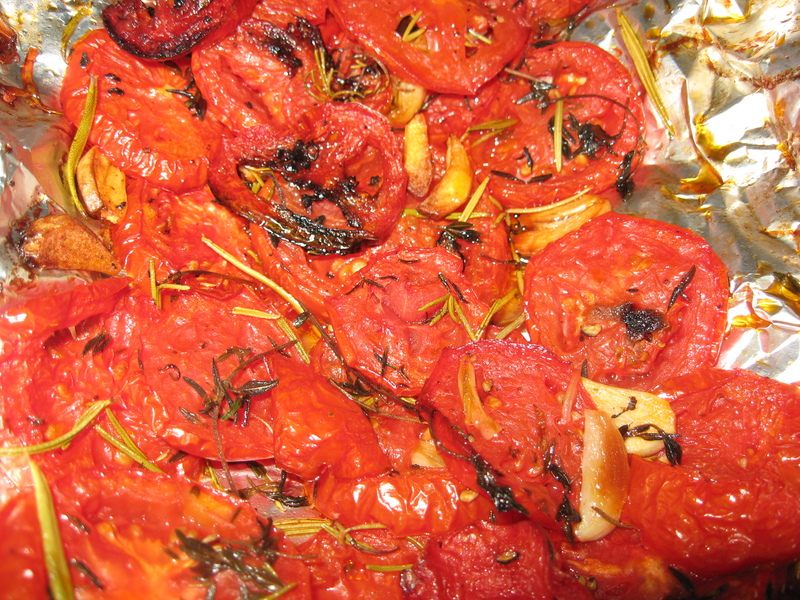 In a medium size bowl lightly mix the tomatoes with the garlic cloves, olive oil and S&P until they are evenly coated. Place the seasoned tomato slices in one layer on your pan and bake on middle rack in the oven. Bake for about 30 minutes—till the tomatoes are shriveled and softened. Also bake the zucchini inner cut parts for the last 15 minutes (see step #2 below in the instructions for the Zucchini Pasta). 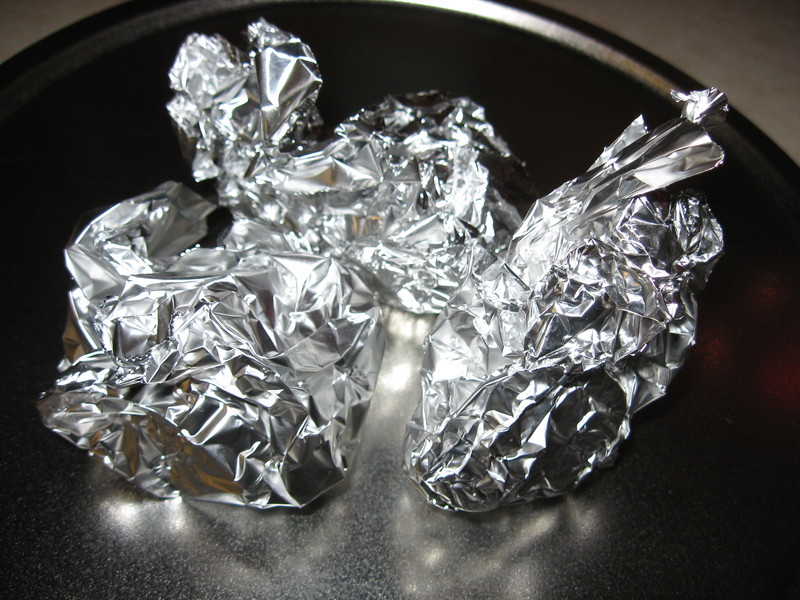 Remove the tomatoes from oven and wrap the aluminum foil around them and place back in oven to keep warm. Same for the zucchini. Hint: Before serving the tomatoes, remove the herb sprigs. 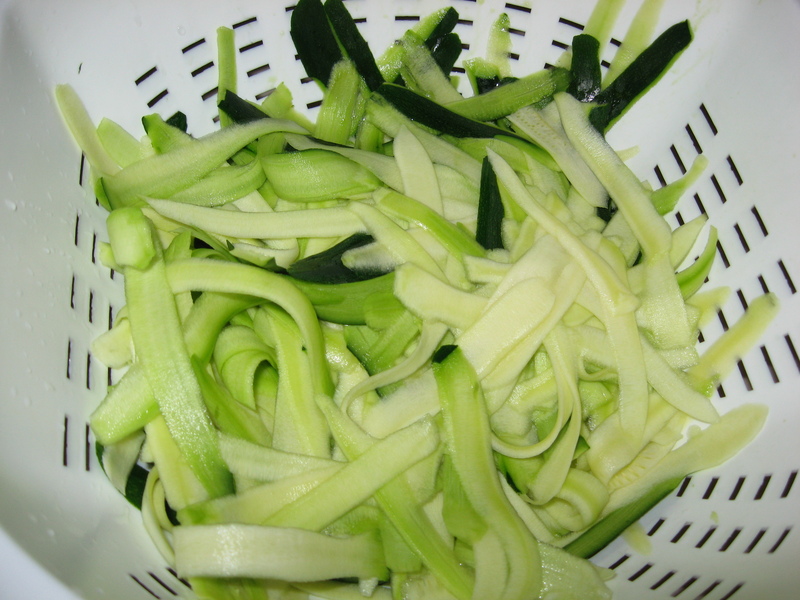 With a vegetable peeler, peel the unskinned zucchini into long strips down to the soft and seedy inner part. Save these parts and cut them into halves. You will be roasting these for a side garnish to your dish. (see instruction step # 5 above). 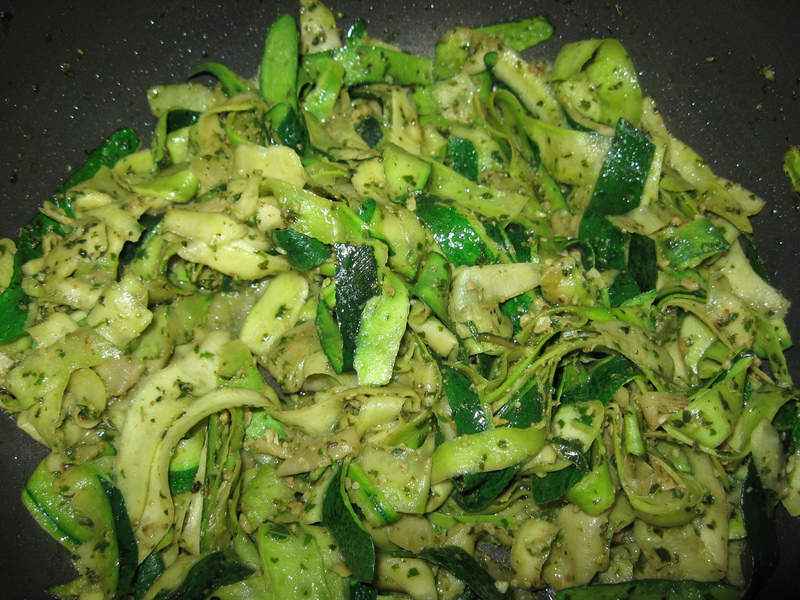 Place the zucchini “pasta” peels in a large pot along with the pesto. Mix well to coat all of the peels and cook and stir lightly over medium heat for 5 minutes. Do this step right before serving. Place ingredients basil leaves, clove, nuts and half of the olive oil in a processor. Process and then add the rest of the olive oil. Finish processing. If you want extra pesto, double (or more) this recipe. It’ll store in the refrigerator for a couple of weeks and will also freeze well (particularly if you top it with additional olive oil) for several months. 1 Tblsp. lightly toasted chopped walnuts or whole pine nuts. So when you toast the nuts for your pesto toast an extra Tblsp. for your topping. I used black forest ham in this picture and it reacted a bit like bacon so it’s a bit crispy and very browned. However, it was delicious, much more economical than prosciutto and still very tasty—always trying to be economical here in my kitchen. This dish was made in an aluminum pan for a friend who had just injured herself in a down hill ski accident. It’s always such a great pleasure to host a breakfast for a group of people and have them enjoy your cooking efforts with big smiles on their faces. That’s part of what was so rewarding in having been an inn keeper at my B&B and now that I have the privilege of writing articles for our wonderful local Weekly Sun, they allow me to play inn keeper every now and then. That’s what just recently happened at our January get together and this is one of the items which I prepared. Of course I want to share this with my readers as well. Here though, before you get to the recipe, are a few little known facts about the asparagus that might be of interest to you. In France, Louis XIV had a special greenhouses built for growing it. The finest texture and the strongest yet most delicate taste which is in the asparagus tips, were called, once again in France, “Les points d’amour (love tips)”. Leave it to the French to make a love connection to the asparagus tips. They were served as a delicacy to Madame de Pompadour. Asparagus was pictured as an offering on an Egyptian frieze dating to 3000 B.C. Romans would even freeze this healthy vegetable high in the Alps, for the Feast of Epicurus. Emperor Augustus reserved the “Asparagus Fleet” for hauling the vegetable and coined the expression “faster than cooking asparagus” for quick action. As well, asparagus is often grown in conjunction with tomatoes because: the tomato plant repels the asparagus beetle while the asparagus repels some harmful root nematodes that affect the tomato plants. So here’s a salute to that “Point D’Amour”. One Lb. asparagus, tough stem ends snapped off and the remainder cut in 2 inch pieces. In a medium pan bring about 2 quarts water to a boil; add asparagus and cook for about 3 minutes-till they are bright green and barely tender. Immerse them in cold water to stop them from cooking more. In a lightly oiled or sprayed 9 X 13 Pyrex or other oven proof dish spread half of the bread cubes. Shredded Parmesan or Asiago cheese. Now place the other half of the bread crumbs on top and layer again as above in #3. In a blender blend the eggs, milk, S&P and lemon peel and pour over the layered ingredients. Cover and refrigerate at least 1 hour or overnight. 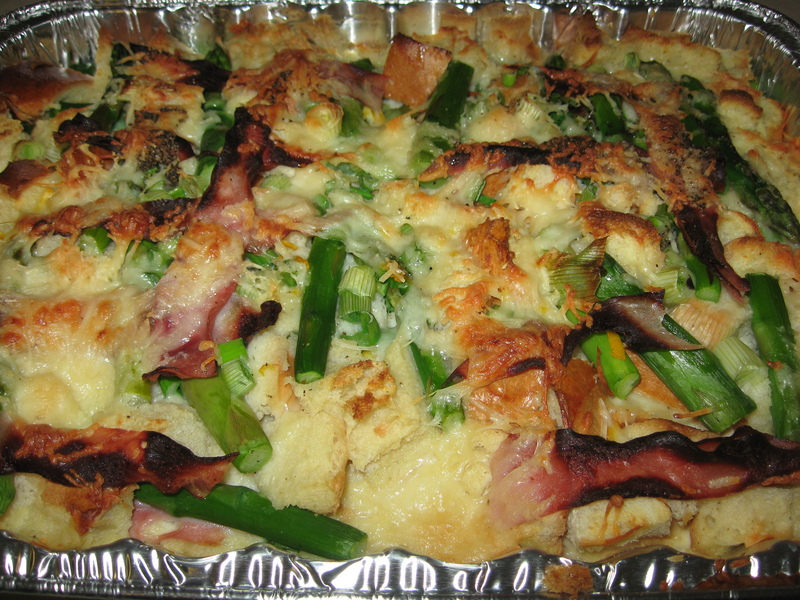 Preheat oven to 350 and bake until center of strata is set and the top is lightly browned (40-50 minutes). Beets weren’t one of my most favorite veggies, however, when I started encountering the golden and other colored milder tasting beets, I became very fond of them. 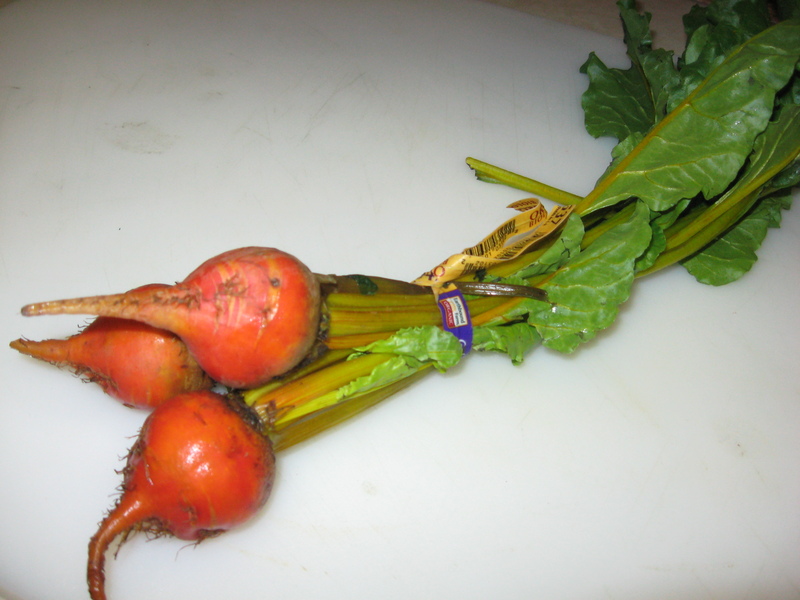 So, when I saw these three gold beets at the market, I couldn’t resist. Beets are truly multi faceted because not only can you use the root but the greens as well. So for dinner last night, I devoured both and it was truly divine. The history of beets is very interesting. It has had a long history of cultivation stretching back to the second millennium BC. Aristotle and Theophrastus mention them. This little root has been used for food, sugar, fodder, food color, medicine and health, as an aphrodisiac, juice, and wine. It can be consumed deliciously cold or hot. Various countries of our world have made this root into a specialty dish and it’s even used as an integral part of a Jewish prayer for Rosh Hashanah. And that is just the root—because the tops are delectable as well. 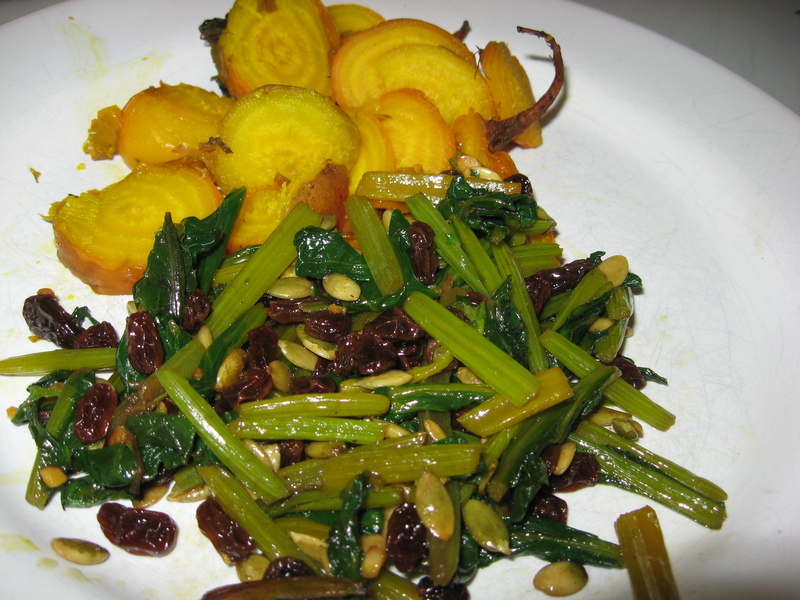 So here are two of my favorite recipes for this miraculous vegetable. Wash/scrub the beets well and leave an inch or so of the green top on to minimize bleeding. Wrap them individually in foil and place them on a baking sheet. You can peel them right away and serve them sliced or whole with butter or olive oil, any vinaigrette, or freshly squeezed lemon juice. I like them with just butter or olive oil. You can also remove, cool and refrigerate them in their foil until ready to peel and use. They’ll last for several days. Then you could serve them cold with a good dressing; or sliced mixed with olive oil, balsamic, ground pepper and salt served over some Greek yogurt. A bit of fresh chervil to top this last suggestion will make this a perfect dish. 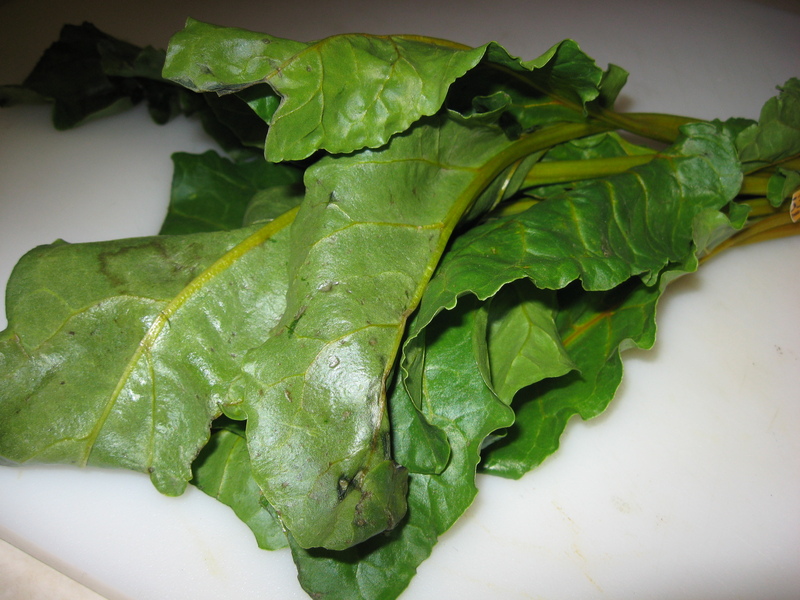 Beet Greens: They actually were “the in- green” eons ago—that is until spinach came along. Wash the beet leaves, cut and then chop the stems. Separately chop the leaves. Bring a pot of water to a boil; salt it. 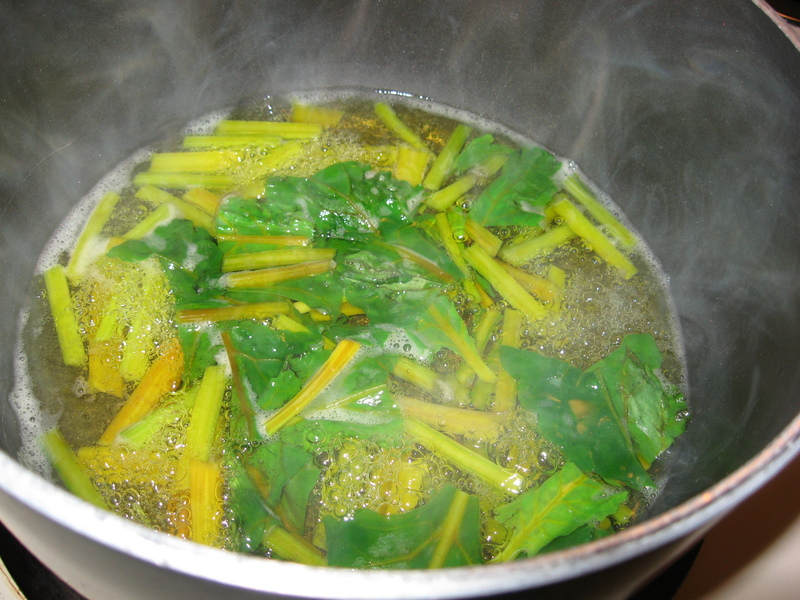 Cook the stems until they are almost tender (about 5 minutes) and then add the leaves. Cook a couple minutes more or until it’s tender. Add butter or olive oil at the very end as well as S&P to your taste. Additionally you can also add the ingredients in the optional #4 paragraph below. Optional: add sunflower seeds (or other seeds of your desire) and raisins at the very end. If you wish you can pre- soak the raisins in warm water for 10 minutes. Also, you can pre- roast the seeds in a pan. 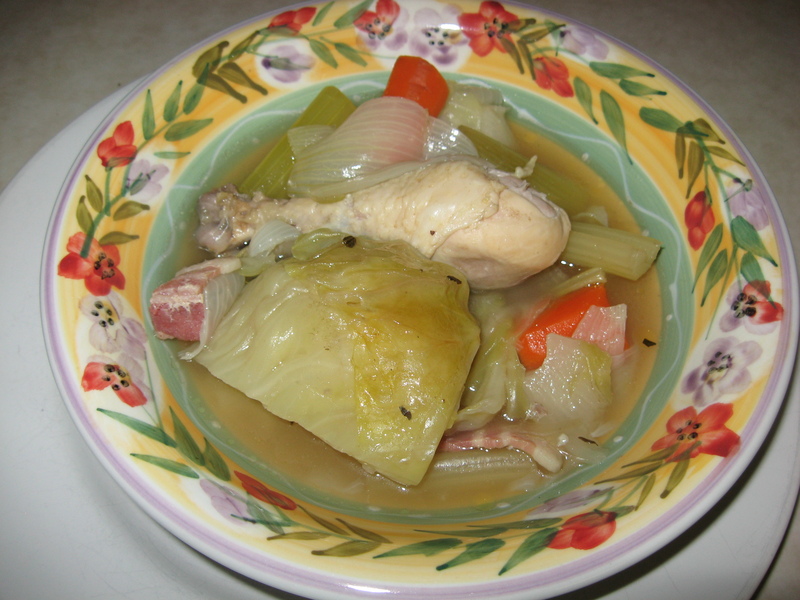 This is a good, easy and nutritional dish to serve. Zucchini and mushrooms are so versatile so it’s nice to see them meld together. Enjoy. 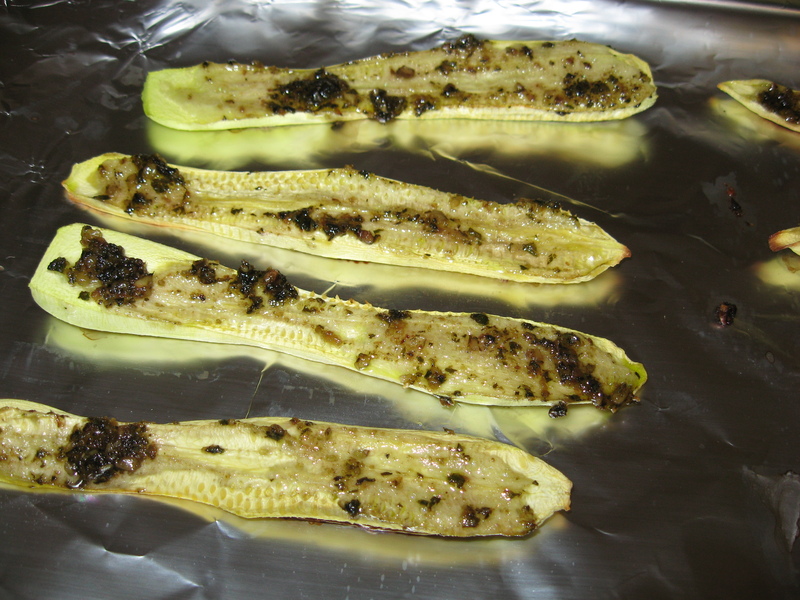 Cut the zucchini crosswise into one-inch slices. Place in a pot with salted water to cover. Add the dill and garlic and some S&P. Cover and bring to a boil. Reduce the heat and simmer gently until the vegetable is barely tender (about 8 minutes). DO NOT OVERCOOK. Drain, reserving 2 Tblsp. of the cooking liquid, and discard the garlic. 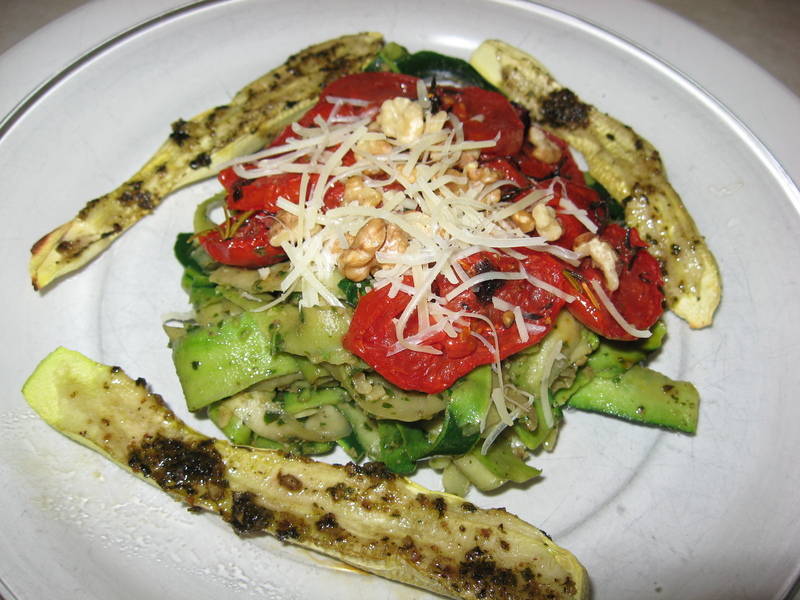 Set the zucchini aside. In a skillet, sauté the mushroom in the butter (about 5 minutes), stirring occasionally till they glisten; then stir in the flour. Cook about 2 minutes longer till flour is well absorbed. To the mushrooms in the skillet add the sour cream and zucchini and the reserved 2 Tblsp. zucchini cooking liquid stirring constantly. DO NOT BOIL but heat thoroughly. Transfer the mixture to a buttered or Pam sprayed casserole dish and top with some buttered bread crumbs. If you wish, you can mix the crumbs with chopped parsley and/or some shredded parmesan. Brown quickly under the broiler. This is a wonderful light and delicious hors d’oeuvres to have-particularly before a hearty dinner. For a faster version, I have used pre-made Caesar bread crumbs and anchovy paste—but the homemade version is a bit tastier I think. No matter, you and your guests will enjoy this and beware-they do go quickly. If you wish to make your own croutons, preheat oven to 350. In a medium bowl, toss the bread with 2 Tbls. of the olive oil and season with salt and pepper. Spread the bread on a baking sheet and toast for about 10 minutes, stirring once, until golden and crisp. In a food processor, blender or by hand, whisk together ingredient #4 through #14. When well blended slowly add the olive oil. Taste to see if you wish to add more S&P. Thinly slice the remaining endive and toss with the dressing and the croutons. Spoon the salad onto each spear and garnish with grated cheese. Note: If you wish you can use a combination of endive and romaine heart leaves to fill and also you can chop very finely some of the romaine for the inclusion in your salad mixture. So then you would have a mixture of endive and romaine hearts. I personally like this combination. It’s also more financially economical.